We're a few short days away from 4th of July and I'm celebrating by sharing these cute and delectable 4th of July Cake Batter Donuts for your family to try this week! 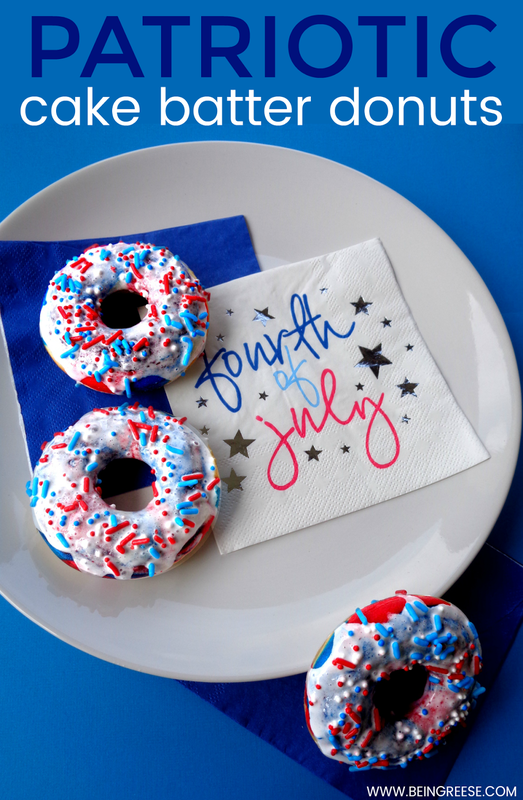 Not only are these donuts incredibly delicious, but they're the perfect showpiece for your 4th of July festivities. 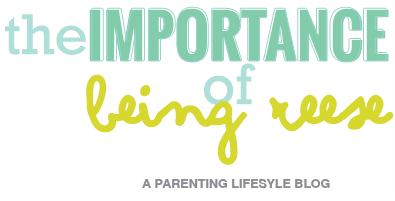 Not to mention, they're so simple, even your tiniest bakers can join in on the fun! Being an Army Brat, the 4th of July has always been a big deal in our family. As a kid, I spent most of my 4th's on post BBQing with friends and family and watching the firework show the Army puts on every year. 25 years later and not much has changed. Except now I'm the one in charge of the food and dessert making. So every year I attempt to put a fun twist of a patriotic dessert for all of us to enjoy. Enter these yummy patriotic cake batter donuts. 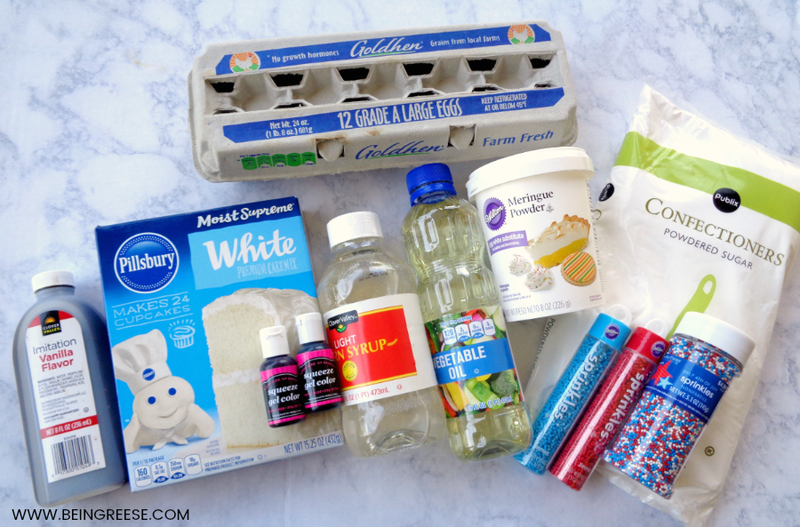 After gathering all of your ingredients, you will first make the cake mix according to box directions., Next split your batter into 3 different bowls. 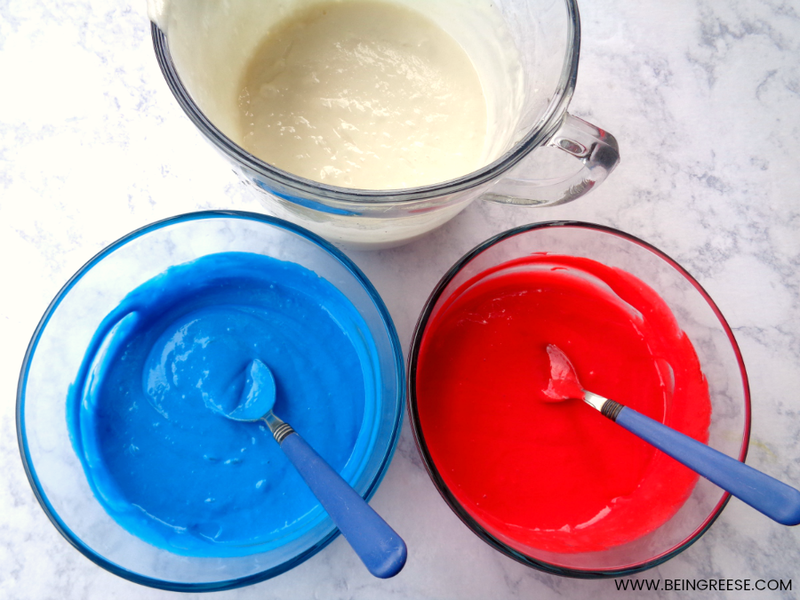 Add blue and red food coloring to two of the bowls and stir until thoroughly mixed. Prepare your donut pan by adding a few drops of oil to a paper towel and wiping the inside of the pans. You can also use a spray oil. 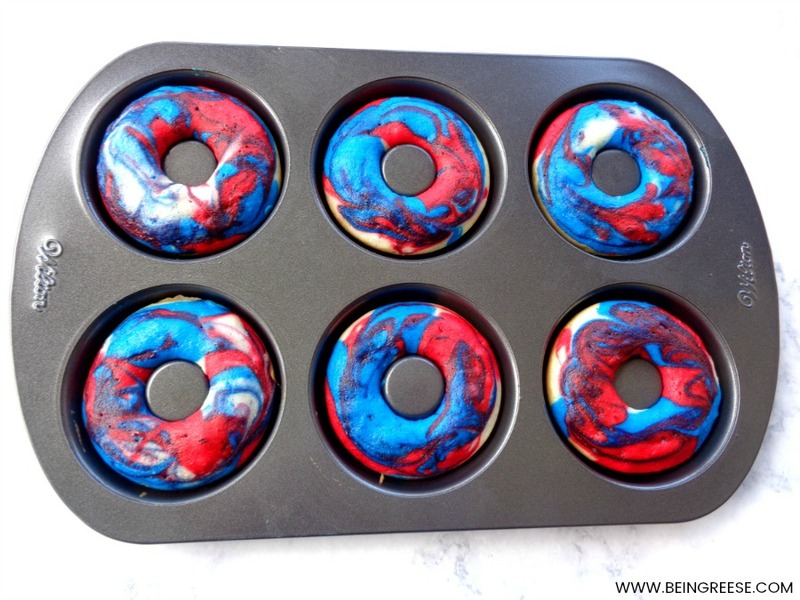 Drop spoonfuls of the red, blue and white batter into your donut pan. Continue to alternate colors until your donut pain is ⅔ full. Bake your donuts for 6-8 minutes at 350 degrees, and then allow your donuts to cool for 5 minutes before removing them from your pan. Once your donuts have fully cooled, dip each donut into your icing. While the icing is still wet, add sprinkles. Enjoy! 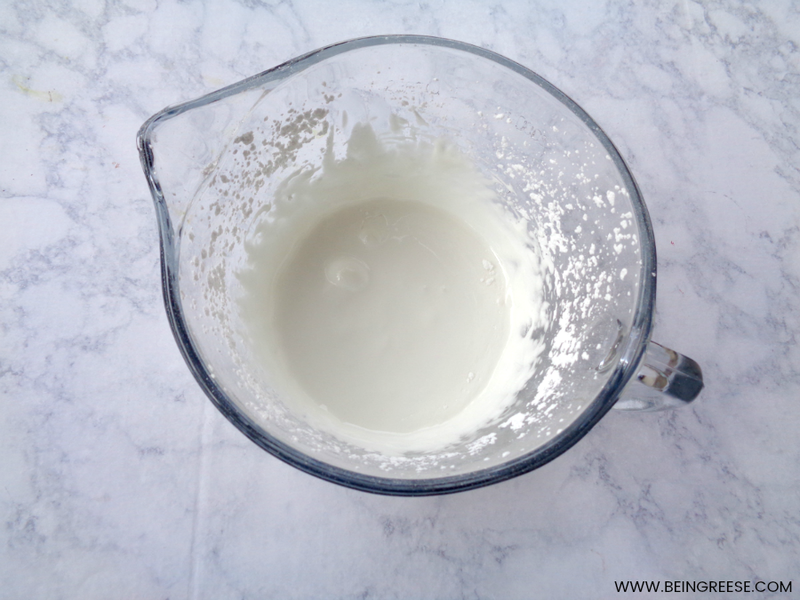 In a mixing bowl, add 4 tbsp of warm water and 1 1/2 tbsp of meringue powder. Beat this mixture until it is frothy and white. Add 2 cups of powdered sugar, 1 tbsp of light corn syrup and vanilla. Beat until your mixture is smooth. If your icing is too thick, add 1/2 a tbsp of warm water at a time until you’ve reached your desired consistency. As usual, if you loved this recipe, be feel free to RETWEET on Twitter to share with friends and family or REPIN on Pinterest to save for later.